In the market for tag management systems? Then this white paper is for you. 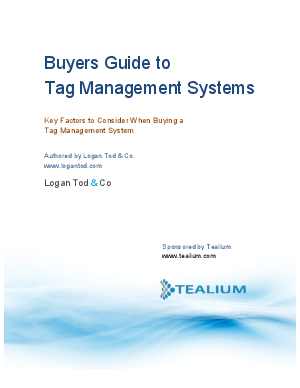 The "Buyer's Guide to Tag Management Systems" reveals the challenges associated with tagging, benefits provided by tag management systems, and features to consider when looking for such solutions. This white paper is authored by Logan Tod & Co. and sponsored by Tealium. Tealium is the leading provider of tag management systems, allowing business users to manage their analytics and digital marketing tag deployments in a simple drag-and-drop interface. Tealium tag management is deployed in days, instead of weeks or months. Tealium helps organizations save on IT costs, streamline their deployments and improve site performance.